Rated 4.5 out of 5 stars.25 total votes. In 1748, in the European village of Audun-le-Tiche, François Boch started a tableware empire that would span more than eight generations of workers, and 250 years of prominence. His simple ceramic plates, cups, pots, and tureens set a standard of excellence for the European market. Four decades later, Nicolas Villeroy set up an earthenware factory in Vauderevange, rivaling Boch's production with its cost-effectiveness. The two companies teamed up in 1836 with hopes of eventually dominating the market. Today Villeroy & Boch is the world's largest producer of ceramics, making everything from egg cups to bathtubs. Its tiles line the Holland Tunnel. Its dinnerware sets the tables of the Pope, crowned royalty, households of the rich and famous, and renowned restaurants around the world. While dinnerware--bone china, porcelain, and earthenware--is still its mainstay, Villeroy & Boch also offers crystal stems and barware, glass drinkware, and stainless-steel flatware, much of which is designed to complement and accent the many beautiful and versatile Villeroy & Boch dinnerware patterns. 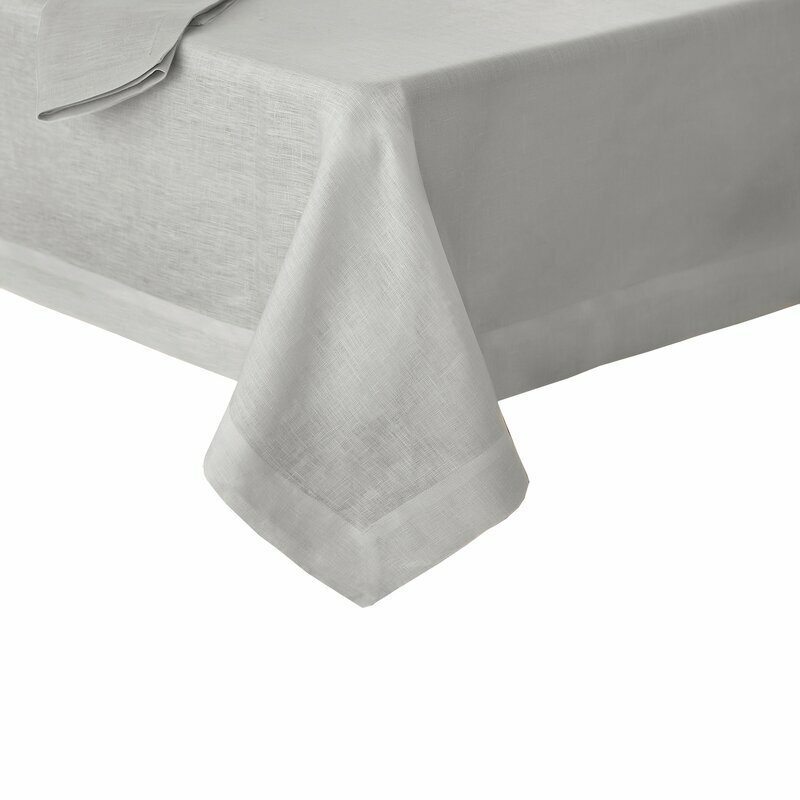 When you buy a Villeroy & Boch La Classica Tablecloth online from Wayfair, we make it as easy as possible for you to find out when your product will be delivered. Read customer reviews and common Questions and Answers for Villeroy & Boch Part #: 219DOG on this page. If you have any questions about your purchase or any other product for sale, our customer service representatives are available to help. Whether you just want to buy a Villeroy & Boch La Classica Tablecloth or shop for your entire home, Wayfair has a zillion things home. I thought delivery was very good. I liked the color - it’s exactly right for my china pattern. However , I think the fabric is lightweight and not the quality I expected. This product was as described. As it is 100% linen it does shrink when washed but I expected that. I ordered several of these and actually used them as curtains. I love them. They are light, airy and fresh. Again, since they are 100% linen they do wrinkle and require ironing. Le tissu est de bonne qualité, bien qu'il soit fin. Beautiful! Vibrant colours. Matches the dishes perfectly. 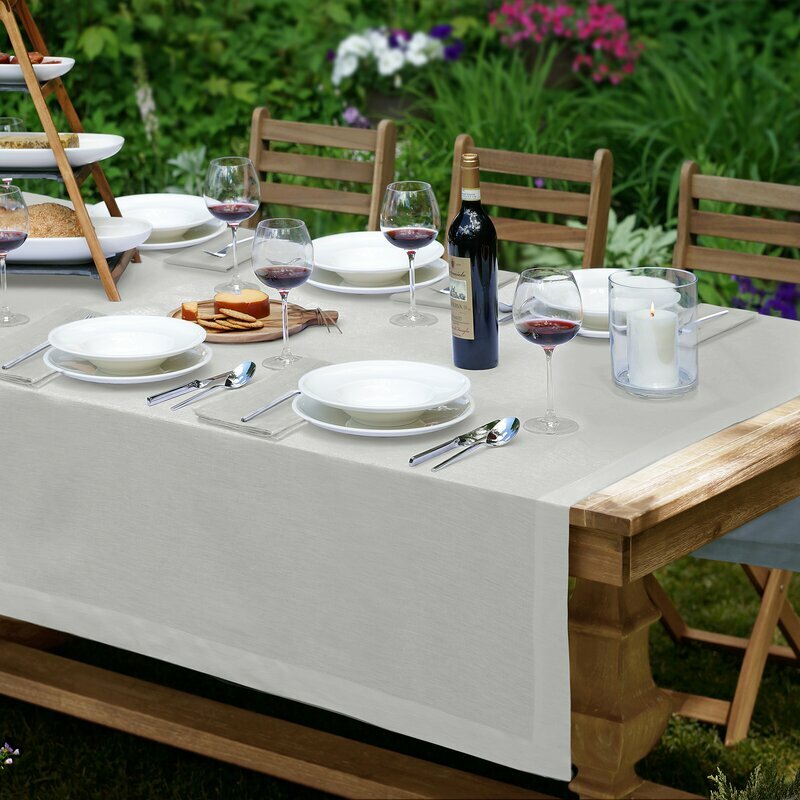 Durable, practical, high quality tablecloths. Won’t disappoint. Rated 4 out of 5 stars.139 total votes. Outfit your dining table in classic style with this tasteful tablecloth, perfect for casual and formal gatherings alike. Though its solid hue may seem understated at first glance, this design features a double border with perforated accents for a decorative touch and an airy feel. Made from polyester, this piece is safe to toss in the washing machine and dryer for easy upkeep after any occasion, so you won’t have to worry about messy meals. Rated 4 out of 5 stars.348 total votes. Add an element of abstract design to your dining room or kitchen decor with the Laurel Foundry Modern Farmhouse lifestyle Kitt tablecloth. This hemstitched, oblong tablecloth combines durability with softness. The natural color tone is sure to fit in well with your existing decor. There’s nothing better than a nice dinner party. You get time to talk with your friends and family, and you get to enjoy great food. Before you host your next dinner party, use this tablecloth to effortlessly update your dining ensemble. The foundation for any fancy dining space, this is a must-have for your home. The solid hue and subtle weave pattern gives this accent versatility, while the 100% polyester material makes it machine-washable for essential convenience. Add this tablecloth to your dining room, then before your dinner guests arrive set the table with crisp white serveware, red cloth napkins, crystal drinkware, and a blooming red rose bouquet centerpiece. Next, bring out your first course, mix up some special cocktails, and welcome your friends and family for a night of fun. Tablecloths has the perfect combination of size, detailing, and color and allowing you to choose the best tablecloth for every occasion. spice up your home and add glamour and ambiance. The notable setting would truly be complete without the perfect table linen. Different colors and made from high-quality natural materials this Tablecloth creates the right feeling for each occasion, as it is elegant, sophisticated and matches perfectly with any tableware. Machine wash up to 80 F, do not bleach. Tumble dry low heat, do not iron up. Dry clean with specific solvent. Rated 4 out of 5 stars.94 total votes. Dress up dinner or any meal with this appealing tablecloth. Kitchen accessory combines the soft, visual appeal of cotton with the durability of polyester. This Embroidered Vintage Design Tablecloths. 100% Polyester. Machine washable. Imported. This elegant Hemstitched Tablecloth is available in a variety of classic solid colors to keep your table timeless and classic but also versatile. Keep it casual for everyday use or dress up for formal dining and take your tablescape to the next level by layering with chic decor elements. The perfect statement of modern elegance. Milano Fabric Tablecloth will drape effortlessly over your table with its soft, luxurious hand. This distressed damask is a beautiful backdrop to an outstanding table scape and allows for endless decorative possibilities.